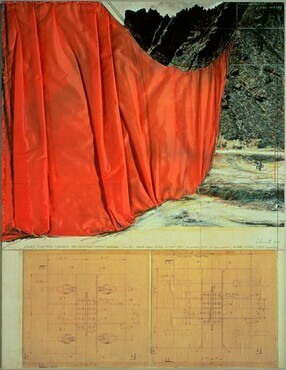 Christo and Jeanne-Claude, and collectors Dorothy and Herbert Vogel met in 1971. Their thirty-year friendship has resulted in a collection that surveys four decades of the artists' career. Owing to the extraordinary generosity of the Christos and the Vogels, this body of work is now in the collection of the National Gallery of Art, where it was on view in an exhibition from 3 February to 23 June 2002. Twenty-six of the sixty-one works in the exhibition are highlighted in this Web feature. Christo (Christo Vladimirov Javacheff) was born in Gabrovo, Bulgaria, on 13 June 1935 and spent his youth under Communist rule. He studied at art academies in Sofia and Vienna. Jeanne-Claude (Jeanne-Claude Marie de Guillebon 1935-2009), whose birth date is also 13 June 1935, was born of French parents in Casablanca, Morocco, and grew up in Paris, Bern, Switzerland, and Gabès, Tunisia, before finally settling with her family in Paris. 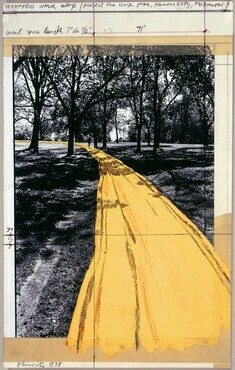 In 1957, Christo escaped from Eastern Europe to the West. He was wrapping objects in various materials at that time, though it was through portraiture that he primarily supported himself. The couple met in Paris in 1958 when he was making portraits of Jeanne-Claude's mother. In 1961, the artists began collaborating on monumental projects--endeavors in which the medium has largely been fabric, chosen for its fluid and ephemeral qualities. 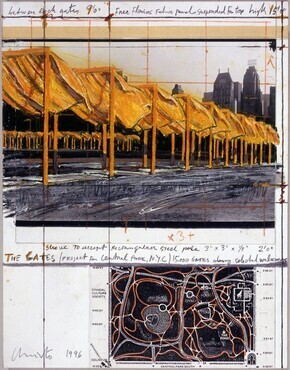 Christo and Jeanne-Claude share joint authorship of the large-scale projects; however, Christo makes the wrapped objects, packages, scale models, and drawings. The projects are solely funded by the sale of these works, as the artists do not accept sponsorship. The Christos' early projects, mainly involving extant architecture, managed to both conceal and underscore the essential character and meaning of a site. Over time, their use of fabric has become freer and more open. The realized projects remain installed for a finite time, yet their impermanence heightens their aesthetic appeal. They only exist afterward in photographs (such as the ten presented on this Web site), preparatory drawings, films, books, and in the memories of viewers. 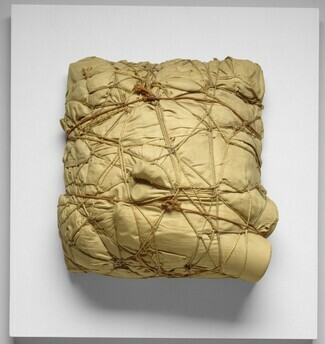 Christo's wrapped objects and packages, which he began to produce in 1958 shortly after his escape from Eastern Europe, reflect his first impressions of Western commercial packaging. The artist completely covered their contents with often intricately folded fabric and bound them with rope or twine. Remaining forever veiled, the packages tempt viewers with their unknown interiors, yet if a package were to be opened, the work would be destroyed. The artist played upon this notion by mailing a package in 1962 to the American artist Ray Johnson, who opened it to find a photograph of the package and a note informing him that he had ruined the work of art. Using salvaged building elements, Christo began to construct works in New York in 1964 that represented actual store fronts. This body of work emphasized two aspects that would remain central to many of Christo and Jeanne-Claude's projects: architecture and concealment. These "store" façades, many of them full scale and illuminated from within, reference consumer culture. The artist, however, teasingly denied access to the contents by applying cloth or paper to the inside of the windows. The Store Fronts, themselves receptacles of display, also reflect upon the museum and its exhibition practices. 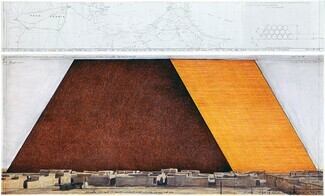 By the late 1960s, Christo and Jeanne-Claude had begun to wrap entire museums, thus obscuring those sites of display. 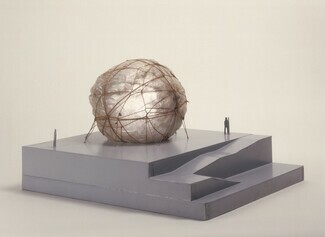 This scale model for a proposed "air package" for the Museum of Modern Art, New York, is related to the monumental pneumatic structures--membranes containing only air--that Christo and Jeanne-Claude created in the mid-1960s. While some were borne aloft, this particular air package (which was never realized) would have appeared as though it had landed on the terrace in the museum's sculpture garden. 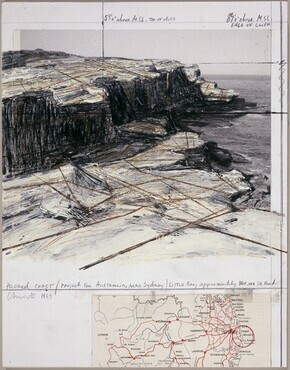 In the fall of 1969, Christo and Jeanne-Claude embarked on their first monumental project in a landscape setting: wrapping the dramatic cliff-lined coast at Little Bay, Australia. The artists, together with 110 laborers and 15 professional rock climbers, transformed the coastline into a sculptural space in just one month. One million square feet of a light beige erosion-control fabric and 35 miles of polypropylene rope shrouded 1 1/2 miles of the rocky shoreline; the installation ranged in height from sea level to the 85-foot cliffs and in width from 150 to 800 feet. Completed on 28 October, Wrapped Coast remained on view for ten weeks before the area was returned to its original state. As with all of their succeeding endeavors, the materials for Wrapped Coast were recycled. 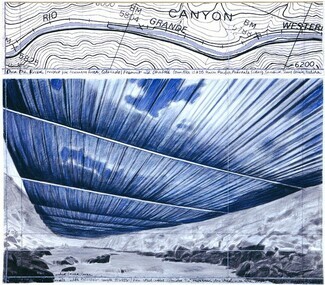 Christo and Jeanne-Claude's first monumental project in the American landscape, Valley Curtain featured fabric that was non-containing, more dynamic, and freer. An enormous expanse of vivid orange nylon polyamide was installed between two mountains 1,250 feet apart to create an artificial barrier ranging from 182 to 365 feet in height. During the first installation, attempted in 1971, the curtain was damaged irreparably by winds. Christo and Jeanne-Claude quickly retrenched: the curtain and its moorings were redesigned, and engineers monitored wind velocities. The second attempt, executed on 10 August 1972, was successful, but unpredicted gale force winds arose and necessitated the curtain's removal after merely twenty-eight hours. Valley Curtain thus demonstrates the artists' determination to see their ideas through to completion. It also captures the essence of the large-scale projects: the installation is of vital importance, although the duration is finite; and the realized project remains in viewers' memories. 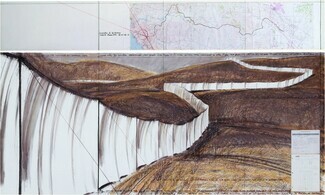 Christo and Jeanne-Claude's Running Fence traversed Sonoma and Marin Counties in northern California from 10 to 23 September 1976. Inspired in part by fencing that demarcated the continental divide in Colorado, the fence was 18 feet high and followed a 24 1/2-mile-long-serpentine path through hilly pasturelands into Bodega Bay. After nearly a year of planning, Christo and Jeanne-Claude swathed the formal walkways and jogging paths of the Jacob L. Loose Memorial Park with more than 135,000 square feet of golden apricot-hued nylon in early October 1978. The luminous material, cut 30 percent wider than the supporting surfaces, rippled like water. These "rivers" of fabric were installed in less than three days, with eighty-four workers, including thirteen professional seamstresses with portable sewing machines, assisting. Visitors were able to experience the project, on view from 4 to 16 October, not only visually, but also physically, as they walked or jogged on the nearly three miles of covered pathways. 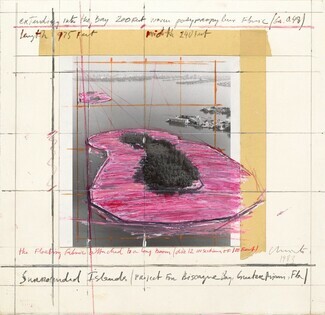 Using 6.5 million square feet of floating pink fabric, Christo and Jeanne-Claude encircled eleven islands in Miami's Biscayne Bay, extending the perimeter of each island by 200 feet. An elaborate undertaking that involved legions of contractors, engineers, attorneys, and seamstresses, Surrounded Islands also required extensive consultation with marine biologists and ornithologists. Ultimately, the project benefited its surroundings: Christo and Jeanne-Claude's crew removed forty tons of garbage from the uninhabited islands. Evoking hibiscus flowers and flamingos, the vibrant woven polypropylene fabric was sewn to correspond to the contours of each island. As the unfurling began on 4 May 1983, the islands themselves seemed to bloom. The artists and their crew of 430 surrounded the last island three days later. Remaining on view for two weeks, the work was visible to the public from the causeways, the land, the water, and the air. 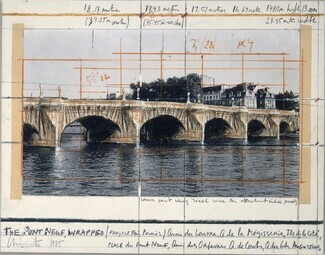 Conceived in 1975, this project for the Pont-Neuf, the oldest bridge in Paris, marks Christo and Jeanne-Claude's last proposal to wrap an extant structure. After obtaining the approval of both the mayor of Paris and the president of France, the artists and 300 workers began wrapping the bridge on 16 September 1985 with a golden sandstone fabric. With the exception of the roadway, the entire surface was covered with 454,178 square feet of the woven polyamide material. The drapes and folds of fabric softened and transformed the Pont-Neuf, while terracotta-colored polypropylene rope accentuated its proportions. The result recalled a series of caryatids, or classical draped statuary. Witnessed by three million visitors before its removal on 5 October, the project has been considered the most sculptural of the Christos' monumental works. Installed simultaneously in Ibaraki Prefecture, Japan, and in southern California, two cultures separated and joined by the Pacific Ocean, The Umbrellas was designed in vivid blue for the verdant environment of Japan and in bright yellow for arid southern California. However, structural components were the same: each umbrella stood more than 19 feet high, opened to a 28-foot diameter, and weighed 448 pounds. After choosing a lush inland valley seventy-five miles north of Tokyo, Christo and Jeanne-Claude secured permission from 459 property owners (most of them rice farmers) and government agencies in 1987 and 1988. The project was scheduled for early fall, when the landscape would be very green after the summer rains. The 1,340 blue umbrellas, ninety of which stood in the Sato River, were placed at close intervals over twelve miles, reflecting the scarcity of land and the population density. The artists selected an inland valley sixty miles north of Los Angeles and met with the region's twenty-five landowners and government officials in the fall of 1987. To highlight the spaciousness of the uncultivated pastureland, the artists installed 1,760 umbrellas over eighteen miles in a more open manner than in Japan. The vibrant yellow of the umbrellas was chosen to stand out against the brown hills in the dry California fall. On 9 October 1991, nearly two thousand workers in Japan and California opened the 3,100 umbrellas at sunrise. While Jeanne-Claude stayed on in Ibaraki, Christo flew to California in order to witness the synchronized event in both locations. 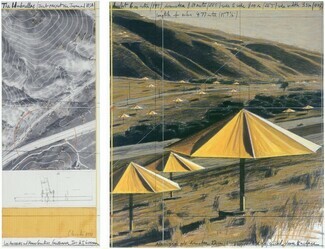 Representing temporary shelters against the elements, The Umbrellas remained on view in both valleys for eighteen days before a simultaneous removal on 27 October. In 1971, ten years after the construction of the Berlin Wall, Christo and Jeanne-Claude conceived of wrapping the Reichstag, which as the former seat of a democratic German parliament had become a potent symbol of a city and country divided. But the artists, who met with hundreds of East and West German government officials, did not receive permission to wrap the historic structure until 1994, after reunification. A 200-ton steel framework was constructed to alter the proportions of the building and allow 1,076,000 square feet of aluminum-coated polypropylene fabric to cascade over the sides of the structure. From 17 to 24 June 1995, workers unfurled the metalized fabric and bound it with 17,060 yards of blue polypropylene rope. Wrapped in the silvery material--more than double the covered surface--the building seemed to move in the wind. Five million visitors witnessed this new transformation of the Reichstag, which remained on view until 7 July. Created in 1998, more than three decades after Christo and Jeanne-Claude first proposed wrapping live trees, this project was scheduled for autumn, when leafless branches would enhance the elegiac nature of the work. A shimmering veil-like woven polyester (used in Japan to protect fragile trees from frost and snow) was selected to allow the trees to "breathe." On 13 November, the Christos and their team began the installation, which covered 178 trees (ranging in height from three to eighty-two feet) with 592,034 square feet of polyester secured with over 14 miles of rope. On view for three weeks, Wrapped Trees was extremely dynamic: varying silhouettes of trees moved in the wind with the skeletal framework of branches made visible when the translucent material was backlighted by the sun. Oil barrels have consistently held a place in Christo and Jeanne-Claude's work, from Christo's wrapped oil barrels of 1958 and the 1962 Iron Curtain--Wall of Oil Barrels, to a wall of 13,000 barrels constructed in the Gasometer, Oberhausen, Germany, in 1999. The artists' proposed project for the United Arab Emirates will take the form of a colossal mastaba, a trapezoidal tomb used in ancient Egypt. Comprising 390,500 vividly colored oil barrels, the Christos' mastaba (at 492 feet high, 984 feet wide, and 738 feet deep) will be comparable in size to the great pyramids. Its immensity and location will address the enormous global consumption of, and dependence on, oil. The Gates, exhibited for 16 days during February 2005, emphasized Frederick Law Olmsted's organic design for Central Park. Seven-foot-long panels of saffron-colored nylon, suspended from 7,503 steel gates, moved with the gentlest breeze to create a flowing canopy, a "golden river," over the park's walkways. Measuring 16 feet high and from 5 1/2 to 18 feet wide to accommodate the varying spans of the walks, the individual gates were installed along 23 miles of Central Park's stately paths. First proposed to New York City in 1980, The Gates was approved in 2003. For Over the River, approximately 1,025 fabric panels will be suspended horizontally high above the Arkansas River, with designated interruptions, over a forty-mile range between Salida and Parkdale. Once permission is granted, the project will be installed for two weeks during the summer, in 2013 at the earliest. The fabric, suspended ten to twenty-three feet above the river, will be translucent when seen from below, affording rafters and kayakers a view of the sky. However, when seen from above, from trails or the highway, the panels will appear opaque. Through its intermittent installation, Over the River will seem to materialize and dematerialize, heightening the project's ephemerality. Christo and Jeanne-Claude have likened their approach to that of nomadic tent cultures: both create fabric structures that appear in the landscape, then disappear without a trace. Overview: This exhibition of 72 works in various media by Christo and Jeanne-Claude was drawn from the Dorothy and Herbert Vogel Collection at the National Gallery of Art. The works represented four decades of the artists' careers. 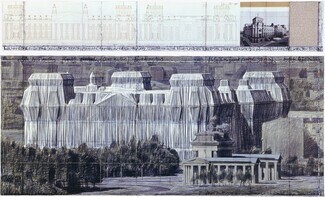 Preparatory drawings, collages, scale models for proposed large-scale works, and photographs of completed projects were included. A series of documentary films chronicling the projects of Christo and Jeanne-Claude were shown in the East Building auditorium. Organization: The exhibition was organized by the National Gallery of Art, Washington. Molly Donovan, assistant curator of modern and contemporary art, National Gallery of Art, was curator. 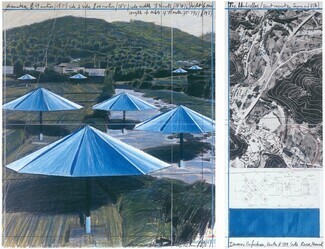 Catalog: Christo and Jeanne-Claude in the Vogel Collection, by Molly Donovan. 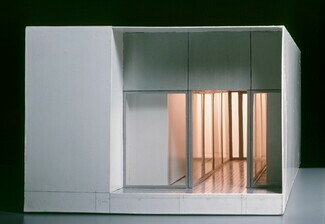 Washington, DC: National Gallery of Art; New York: Harry N. Abrams, Inc., 2002.